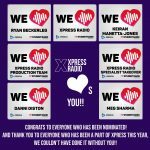 Xpress Radio is an award winning student radio station, founded in 1996. We are part of Cardiff Student Media, alongside gair rhydd, Quench magazine and Cardiff Union TV. We are student led, with all members being students at Cardiff University. We work independently and aim to give all students the creativity and freedom that can be found within student radio. We broadcast from Cardiff Students Union. We broadcast in student term time, on weekdays from 07:30 – 00:00, and on weekends from 10:00 – 00:00. Our shows include entertainment, speech, sport, specialist and cymraeg. We are proud to broadcast in both english and welsh, not only with our shows but music as well. We currently have a welsh-language show every day of the week, including a breakfast show! You can listen to us online via the listen tab! We also broadcast throughout the Students’ Union, and are on the Tunein app. Xpress Radio is a radio station run by students, for students. All of the management and committee are volunteering students, as are our presenters, producers, interviewers, audio engineers etc etc etc, and the current Station Manager is Cardiff University student, Meg Sharma. For a full list of contact emails, head to the Contact page. This is Xpress Radio. Your uni, Your sound.